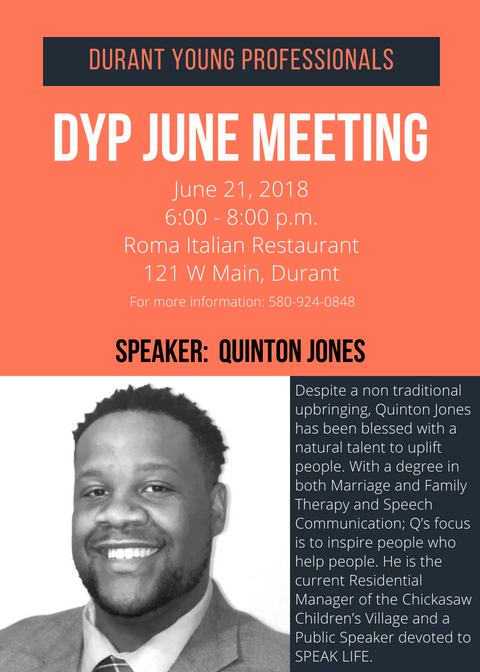 Durant Young Professionals (DYP), under the guidance and direction of the Durant Area Chamber of Commerce, was launched in 2013 as a way to serve young professionals (20s, 30s, and the “young-at-heart”) in the Durant area. The mission statement for DYP reads: To Provide opportunities to experience life with young professionals; opportunities to emerge and develop as leaders; and opportunities to engage the community through learning and service for the purpose of identifying, retaining and supporting the latest group of movers, shakers, and history makers of southern Oklahoma. DYP’s involvement in the community is invaluable. Community-wide events hosted by DYP have included an exciting chili cook-off at SOSU’s Tailgate Alley, A Market Fair at Market Square in the fall and more. DYP membership meetings include social networking events like canvas paint nights along with dinner or lunch gatherings each month. DYP members also participate in a countless number of community events providing hours of volunteer time and service. 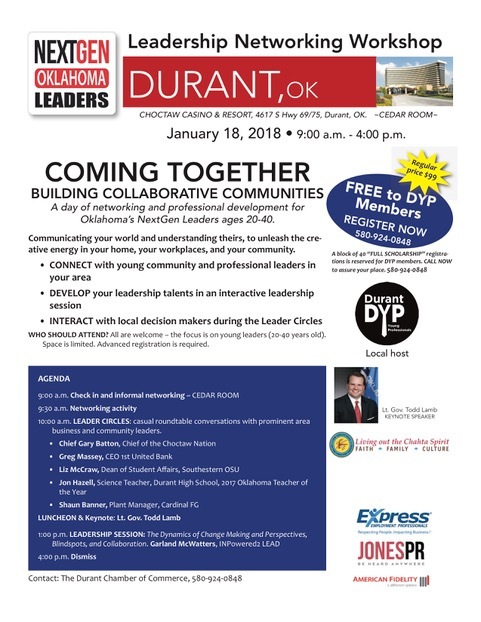 For more information on Durant Young Professionals, contact the Durant Area Chamber of Commerce at 580-924-0848. Annual membership to DYP is just $20 for Chamber members and $25 for non-Chamber members. Please visit our Facebook page for all of the up-to-date information on DYP events!